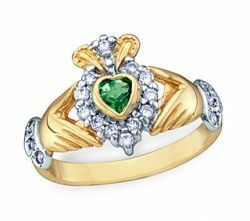 Irish Claddagh rings are a symbol and a reminder of loyalty and shared history. These distinctive pieces can be simple or adorned with gemstones, or even diamonds, but the message of the Claddagh is the same: respect for heritage. 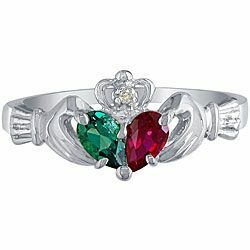 In addition, the Claddagh can send a subtle yet clear message about secrets of the wearer's heart: turn the ring one way, and you are seeking companionship; turn it another, and you are letting everyone know that you have a sweetheart. This lens will enter into the myths, history, and beauty of the Claddagh. 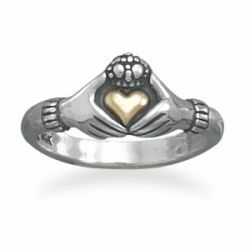 If you are trying to think of a meaningful gift for someone close, consider the Claddagh ring. 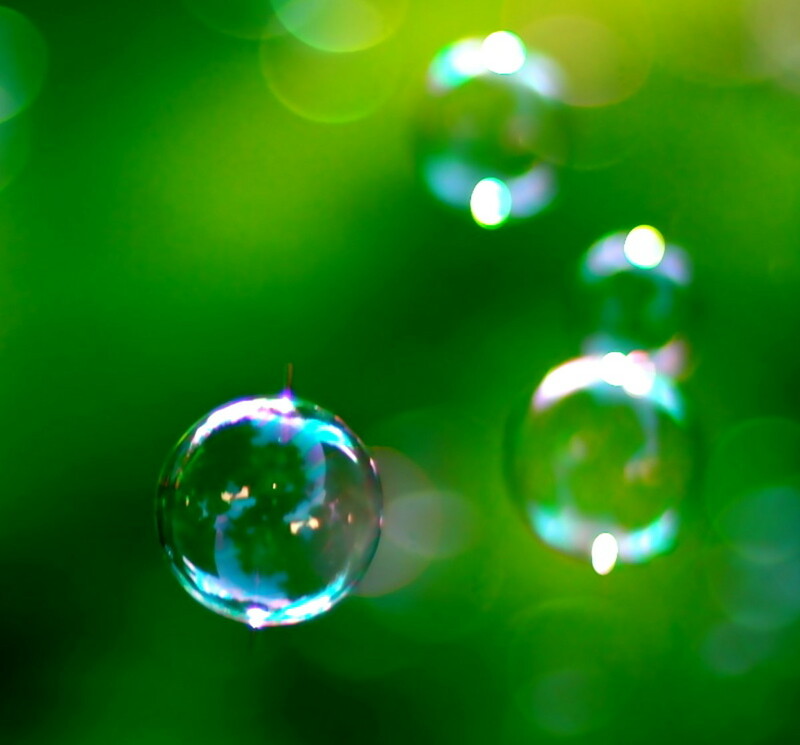 Heart Facing In, Heart Facing Out -- What Does It Mean? On the right hand with the heart facing outward, the wearer is single and may be looking for love. 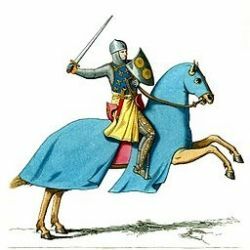 On the right hand but turned inwards, the wearer is in a relationship, or their heart has been "captured". On the left hand with the heart facing outward, the wearer is engaged. On the left hand but turned inwards, the wearer is married. Confused? 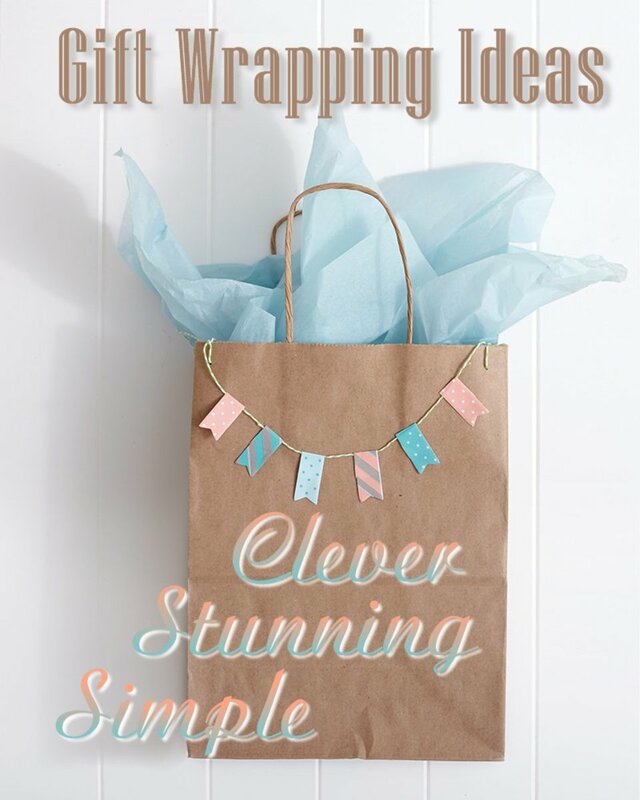 This Video Makes it Easy! 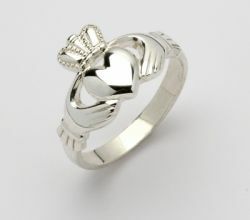 The Claddagh ring has been given as a token of affection, or even love, since the 17th century. 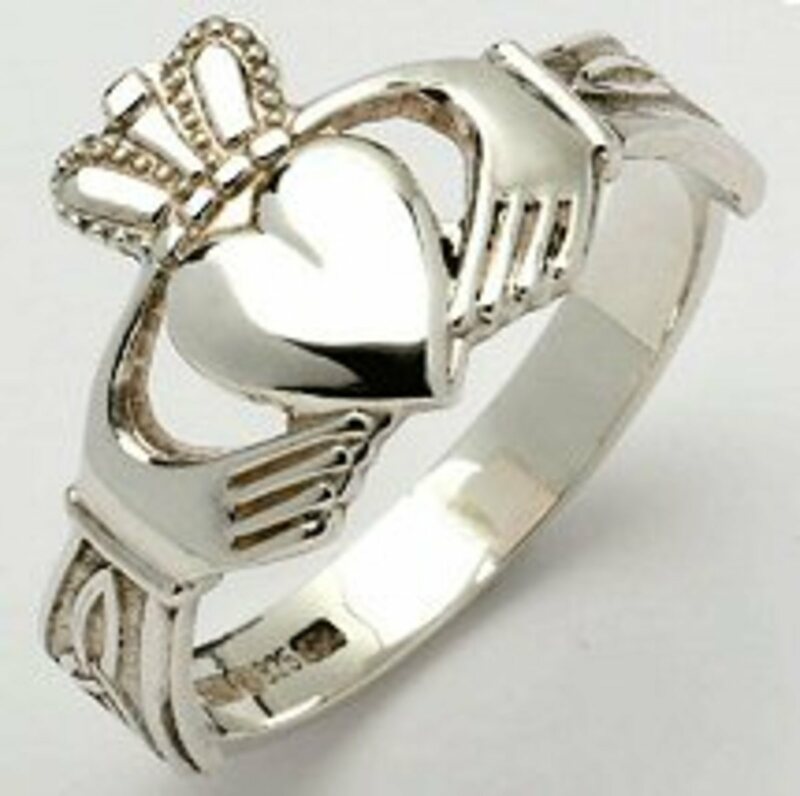 Irish tradition dates the giving of the Claddagh ring back to at least the reign of William and Mary, with several elements of the ring's design dating back as far as the Roman empire -- more than two-thousand years. 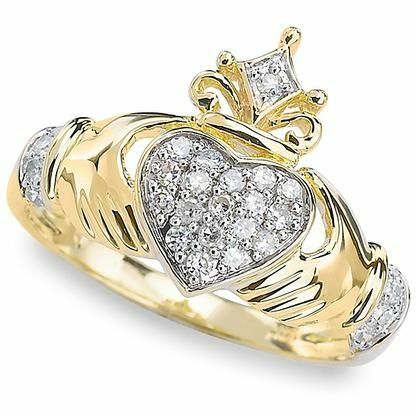 Though the Claddagh ring has been produced continuously since at least 1700, the actual name "Claddagh ring" is much more recent, with some sources placing the origin in the mid-19th century. Some sources refer to the ring typically being passed from mother to first-married daughter. 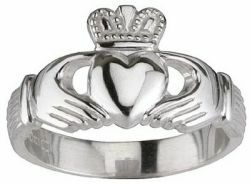 The result is that Claddagh rings are frequently quite old, having been in the family for several generations. The Claddagh ring was not particularly well-know or widespread, especially outside of Ireland, until the 19th century. It was not until the Victorian period that the tradition became better-known throughout the British Empire. A company called Galway jewelers produced a version that soon became quite fashionable, especially after a ring was presented to Queen Victoria in 1849. Soon goldsmiths throughout the area were making Claddagh rings. 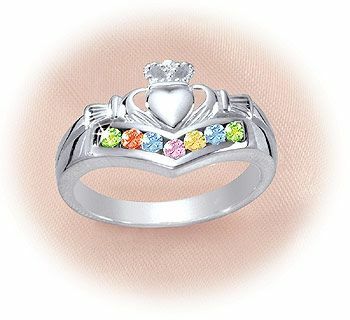 These rings retain the power and design of the Claddagh but present them in media that are more affordable, and more for every-day wear. They may also become a family heirloom, like Claddagh rings that feature a celtic knot design. 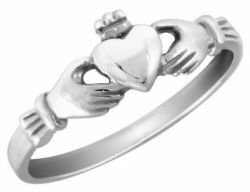 Other rings, also in silver, are surprisingly affordable -- under $20 for this lovely traditional Claddagh in sterling silver, as is this nice sliver hand-heart Claddagh. 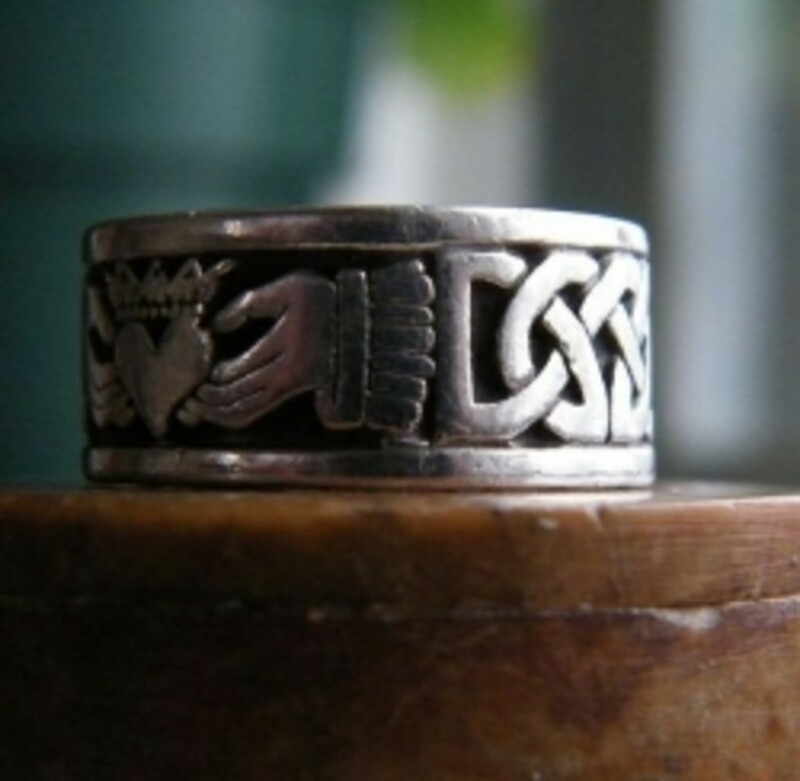 According to author Ida Delamer, "The story of the Claddagh ring ... has so much folklore and myth attached to it that it is difficult to know where legend ends and truth begins." In the Roman age, when several elements of the ring were established, clasping hands as used as symbol of promises and vows, and the same gesture was often part of marriages up through the Renaissance. Other origin stories come from areas around Galway, Ireland, where silversmiths and Goldsmiths produced the ring, contributing to the legendary aura that surrounds the ring. These beautiful rings, represented by the straightforward design of this illustration, hew close to the traditional designs of the original Claddagh. A ring like this one, in gorgeous solid gold, is reasonably priced and will increase in value as the years go on, making it a perfect family heirloom. Similar rings, like this solid silver piece, are also powerful statements of faith, tradition, and affection. And still, you don't have to be Irish to wear the Claddagh! 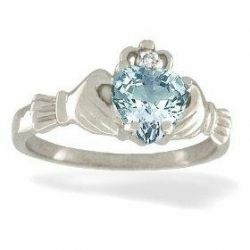 Aalthough not strictly adhering to the standard Claddagh design, gemstone rings are quite popular -- this pale blue stone is representative of some of the more beautiful designs. Rings like this emerald-and-silver piece combine the appeal of the history and story of the ring with a gemstone. Other varieties include topaz, red ruby cubic zirconia, and this brilliant blue sapphire Claddagh ring that are all guaranteed to turn heads. The design of the Claddagh ring is hard to miss -- you have almost certainly seen them on someone's hand, assuming you don't own one yourself! The design is made of two hands holding a heart, often topped with a crown. Some sources claim that these three elements represent love (the heart), friendship (the hands), and loyalty (the crown). These days, Claddagh rings represent friendship, or, depending on which way the heart is facing, devotion to one special person (read on for the "code of the Claddagh). A Lovely Original Claddagh Ring Song - Love Her Voice! 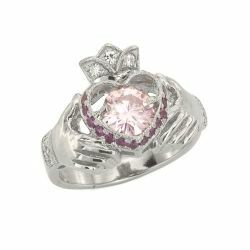 These special rings augment the traditional message of the Claddagh with the singular beauty and value of a diamond. 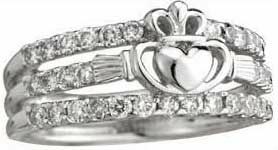 Sometimes Claddagh engagement and wedding bands can be found -- pieces like these three-ring diamond bridal bands are one of a kind and quite rare (this piece is an exceptional value at 50% off). Other diamond Claddaghs are purely decorative. 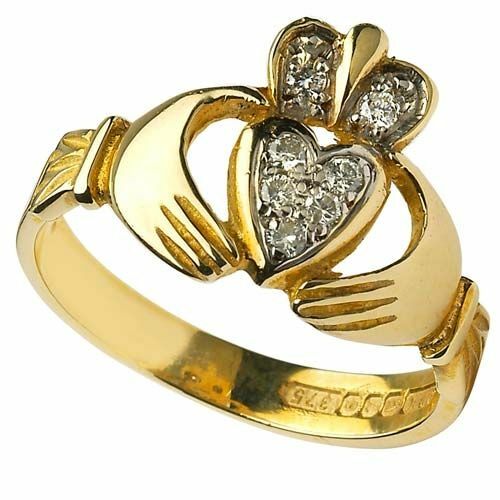 this gold-and-diamond Claddagh ring -- truly a unique and meaningful gift. Are all good choices for the man who is proud to wear his Irish heritage for all to see. And if the man in question is attached, the Claddagh sends a subtle but clear message: this one's taken! 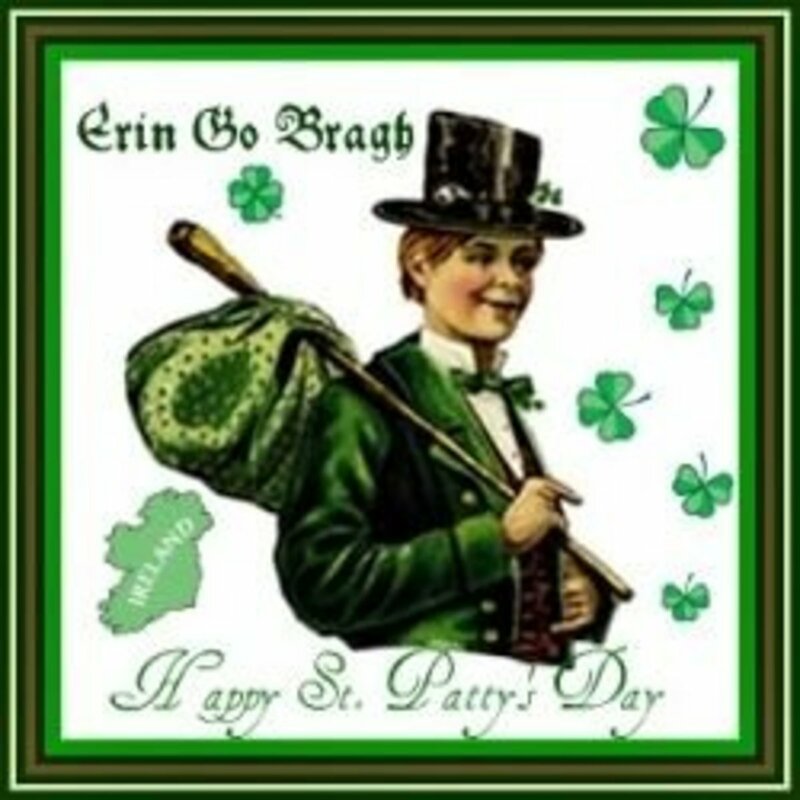 While perhaps not at the top of the heap in terms of meaningful messages and honor to Irish heritage, there are some entertaining and quirky choices out there, if you are so inclined. The ring in this picture is typical of these designs. If you are less of a piercings person and more of the toe-ring type, there are many quality pieces out there for you as well. How fascinating! Thanks for sharing such a precious tradition so beautifully. I've worn my claddagh for years and love the mythology that surround it. You have presented some beautiful rings here - and I love the whimsy of the belly ring, nice touch! I never wear jewelry myself (too dangerous when I have to handle the sheep), but I love your informative lens. I love these ring gifts, so nice.